Advent is still officially a few weeks away. But I often think that, here, we are in a state of perpetual advent. A state of waiting. A state of hoping. A state of watching for signs of the in breaking of God’s vision for the world. As I walked through the gates of this little church where I have the honor and privilege of serving as pastor, there were already a number of people waiting. Waiting for appointments. Waiting to speak with someone. Waiting to see what today will bring. This is not unusual. In fact, it is the norm. We work primarily with refugees. And for refugees, waiting is a constant state. Waiting for appointments. Waiting for news. Waiting…and hoping…that something might change, something that will give them a break from the constant state of waiting. They are waiting for a chance to begin a new life in a new place, a chance for a new opportunity, a chance to enroll children in education, or have access to desperately needed medical treatment. They are waiting to share their stories. They are waiting for their voices to be heard. This state of waiting is especially heightened for me today, as I wait to see what will happen as, across America, people vote. I am waiting to see what happens as this long and vicious election cycle finally comes to an end. I am waiting to see what happens tomorrow when a lot of people are angry and upset that their candidate did not win. I am waiting to see what happens the next day and the day after that as we figure out just what it means for us to be citizens of the land of the free and the home of the brave. I am waiting for a whole number of reasons, but one of the big ones, for me these days, is to find out what will happen for the people with whom I work who look to my country as a place of refuge. People who have waited for a long time to have the chance to start again in America. People who, by the time they arrive, will have waited for 18-24 months from the time they heard that their interview process would begin. Almost all of them have waited years to even get to that interview point. People who have waited for countless interviews, who have told their stories multiple times. Their stories have been checked against their family members’. They have been vetted, questioned, interviewed, checked, re-checked, vetted again, interviewed again. It is a long, drawn out, painful, often disappointing process. Do not believe for a second that “they” are just “let in.” That is plain and simply not the way resettlement works. If you have questions about the resettlement process, please let me know and I would be happy to talk more about them with you. I am waiting to find out if my country will still be a place where refugees can look to with hope, or it will be, yet another, disappointment. Yet another place where the walls are built up (physically and metaphorically) and they are told they are unwanted, unwelcome. There is so much that divides us. And we are never better divided. We are always better united. We are always stronger when we work, together, for justice, for mercy, for grace, and for love. We are always better when we look at each other and see, not a stranger or an enemy, but another child of God, also created in God’s image, also known and loved. Please vote. The results of this election matter. Not just for you and your family, but for families across America and around the world. Please, pray. And love. Love, love, love. There are some misperceptions about what it takes to be a resettled refugee in the US. The resettlement process is long and complicated. By the time a resettled refugee sets foot in the US, he or she has been vetted by a whole number of agencies, including the office of the UN High Commissioner for Refugees and the US government. He or she has been through security clearances and health checks. He or she has sat through countless interviews. He or she has waited to be identified as a refugee. The process takes years. People like my colleague, friend, and brother in Christ, Simon, who died last Thursday from kidney failure. Simon was the pastor of the Sudanese Lutheran congregation that meets at St. Andrew’s. Originally from South Sudan, Simon had been sick, and on dialysis, the whole time we have been in Cairo. He applied for refugee status when he arrived, and it was, eventually, granted. Then, he waited. And waited. And waited. He had been accepted into the resettlement process for the US. But his body gave out while he was waiting. When I received the call about Simon on Friday morning, I broke down into sobs. For Simon and for those whose names I do not and will not know. There is a whole lot of heart break in this work. There is so much that is not fair or just. There is so much that is left up to luck or chance or where you happen to have been born. We’re coming up on three years here in Egypt. I have learned so much. I have met incredibly brilliant, compassionate, and deeply faithful people. I have had countless deep, gratifying conversations where I have learned more about the world around me and the realities of it. I have cried some tears and heard stories that will haunt me for years to come. I have been moved to frustration and anger by bureaucracy. I have a whole new empathy and understanding about the refugee crisis, the largest the world has ever faced. And, with brothers and sisters here and around the world, I keep turning back to the promise and hope of Revelation 21:3-4. My brother, Simon, clung to that promise. Our brothers and sisters who mourn his death do, too. I have heard it from them over and over again these past few days. O, Lord, may it be so. For Simon. For you. For me. And for each and every single one of God’s beloved children, of all times and places. This story of Jesus and the Syrophoenician woman, I’ll admit, is one I struggle with. Every single time I read it. I call it “the one where Jesus is a jerk.” There are all kinds of explanations about Jesus’ behavior, but to me, they all try to explain it away. This is not the Jesus who welcomes with open arms, who loves without condition. This is Jesus who is very much a human being, a product of his time and culture and religion. And, to be completely honest, I don’t know what to do with that. I don’t know what to make of this story. But I know this. When I was reading this week, the Syrophoenician woman wasn’t living in the country side outside of first century Tyre. She is living here in Cairo. She is the refugee woman, waiting in the courtyard to speak to someone from psycho-social or RLAP, desperate to secure housing and education and medical care for her child. She is the refugee woman, holding her baby above the water, after being thrown from a boat on the Mediterranean. She is the refugee woman, living in squalor in a camp in Kenya or Lebanon or Ethiopia or Jordan. She is one of millions of women in the world, displaced by war and poverty. All these years after Jesus called the Syrophoenician woman a little dog, too often, she is scorned and told she does not have a place. In spite of the heartwarming stories, such as 10,000 Icelanders offering their homes to refugees or the train in Dresden welcoming refugees with اهلًا وسهلاً (ahlan wa sahlan), there are far too many stories of refugees being told they are not welcome. There is far too much talk of building walls and fences along borders in Europe and the US, and too many bodies washed up on shores, or found decaying in a truck in Austria or in the deserts of the southwestern United States. Too many innocent lives lost because they were born in the wrong place at the wrong time. Because they carry the wrong passport or no passport at all. The Syrophoenician woman defied a lot of social customs. A woman approaching a man. A Gentile approaching a Jew. Most would scoff and call it inappropriate. Some would see it as incredibly brave. And at the same time, incredibly desperate. This is the last resort. She’s likely tried everything else in her power to help her sick daughter. She doesn’t do this on a whim. She does it because she has no other choice. Thursday’s New York Times’ top headlines included, “Unicef Warns of Lost Generation of War Children Out of School.” Across the Middle East and North Africa, 13 million children have been driven from school. Rick Gladstone writes, “In some countries — particularly Syria, which once had one of the world’s highest literacy rates — many children who ordinarily would be third or fourth graders by now have rarely if ever been inside a classroom.” (1) And, “death, mayhem, hunger and disease are among the most obvious risks to civilians in these conflict zones, the collapse in primary education is another compelling reason for families with young children to flee.”(2) Parents who choose to try to get to Europe aren’t doing this on a whim or for fun. They are desperate. They do it for their children. David Lose writes about the woman, “I have no idea whether this woman believed herself worthy of God’s attention and Jesus time. But I know that she believed her daughter was.” (3) This unnamed Syrophoenician woman, by some accounts a wealthy Tyrian and by others, an ostracized villager, is a fierce advocate for her daughter. No matter what she believed about herself, she wanted the best for her daughter. She believed that her daughter was worthy. So do they, all of these women who risk everything on the Mediterranean and in Europe and on the border between the US and Mexico. They believe their children are worthy. Of safety. Of healthcare. Of education. They will do whatever it takes, including risking their own lives and the lives of their children, because they believe those precious children are worthy. What parent out there can blame them? Who doesn’t believe that her child is worthy of a place in the world? Who doesn’t want her child to have education and health care and a safe place just to be? Who doesn’t want to exorcise the demons from her child’s life so that her child can simply grow up? I struggle with this story as I read the news because Jesus isn’t supposed to be the one who turns people away. Jesus isn’t supposed to be the one slinging racial slurs. Jesus isn’t supposed to insult and shame. Jesus is supposed to be the one who welcomes with open arms, who keeps making room at the table. Jesus is supposed to tear down barriers. Jesus is the one who is supposed to say yes when everyone else says no. He gets there. He just needs a little nudge. From a brave, desperate woman who says, in the imagination of Karoline Lewis, “Guess what, Jesus? God said yes to me. God said yes to me when God tore open the heavens. God said yes to me when God decided to show up in the wilderness rather than in the temple. God said yes to me when you came here instead of spending all your time in Jerusalem.” (4) This woman is the only character in Mark to best Jesus in an argument. (5) Her daughter is healed. And soon after, a deaf Gentile will hear and 4,000 will be fed. All of the sudden, the borders that had been drawn are breaking down. And we see the Jesus, who came for the sake of the whole world, at work. Like the Syrophoenician woman and the deaf man in Decapolis, there are a lot of us out there who yearn for healing. Physical healing, but also healing of our hearts and souls. Healing of this world that is so very broken. Healing from all of the things that cause people to be displaced and get on boats and cross dangerous borders. Healing from all of the things that cause so much hatred among people. We long for the world Isaiah speaks of in Isaiah 35:4-7a, where “the eyes of the blind shall be opened, and the ears of the deaf unstopped.” Where “the lame shall lead like a deer, and the tongue of the speechless sing for joy.” Where “the waters shall break forth in the wilderness, and streams in the desert.” Where “the burning sand shall become a pool, and the thirsty ground springs of water.” We long for this world. And, sometimes, we lose hope that it will ever come. I can’t say when it will come. But I can only trust that it will. I can only place my trust in the God who tore open the heavens to enter in a broken, desperate world. I can only place my trust in the one who opened his arms, who died, and who rose so that the world could know life. I can only place my trust in the promise that, somehow, in the midst of all of this brokenness, the Spirit is working to restore this weary world and to make all things new. And that is the promise, isn’t it? To the Syrophoenician woman and the deaf man at Decapolis. To the people desperate to hear good news from the prophet Isaiah. To people across the ages who long for healing and cling to little, tiny threads of hope, all the way to us, weary of war and violence and oppression and poverty. When Jesus looked at a Syrophoenician woman and saw not a stranger, but one worthy, the heavens tore open a little wider. When Jesus healed that little girl, they tore even wider. They tore a little wider and showed a little more clearly that the world as it is is not the world as God intends it to be. God knows it is still not. God is still working. God is still mending and healing. God has not, and will not, and will never, abandon us, no matter where we find ourselves on this planet. God doesn’t care about passports or countries of origin. God cares about people. Every single one of the precious children who is born on this planet. God is tearing open the heavens and working in this world for each and every single one of them. Like the Syrophoenician woman who fights for her daughter, God will keep fighting for each and every single one of God’s beautiful, beloved, worthy children. Even when it seems impossible and so unbelievably unlikely, God is, somehow, working in this world to restore and redeem. God is at work tearing down boundaries and breaking down barriers and making all things new. For us and for our children. For the stranger and the enemy and the friend and the neighbor, for the refugee and for the migrant. And for their children. They are worthy. We are worthy. God, let it be so. Show us it is so. Tonight at our rehearsal, our choir mates will likely be able to tell who sang at the Remembrance service on Sunday because we all have sun burned, red necks. That’s what happens when you sit outside, with your back to the sun, on a beautiful November day in Cairo. Red necks aside, the view that we had, sitting to the side facing the gathered congregation was quite lovely. We could see the faces of the representatives of close to two dozen countries who gathered to remember those who died in the war that started 100 years ago. I watched as representatives from countries spanning the globe–among them: Japan, Australia, Canada, India, France, Pakistan, the US, Tanzania, South Africa–laid wreaths on the memorial. At one point, I saw a tall, suit-clad man wipe a tear from his eye. My voice caught in my throat when our director paused from his directing to place his hand on his heart, as he so often does as a sign of sincere respect, as the US representatives placed a wreath on the memorial. But it wasn’t just about remembering, and certainly not about glorifying, the Great War. The Anglican priest who led the service spoke beautifully and eloquently about working for peace. He acknowledged the countries represented don’t always agree and don’t always get along. And yet, there is a yearning and desire for peace. He spoke about the poppy as a sign of resurrection, growing out of the ruined land of Flanders. During the silence, the military personnel saluting, I listened. Though the people gathered stood quietly, life went on around us. I could hear children laughing from somewhere near by. And there was something about that that served as a reminder of the tenacity of life. 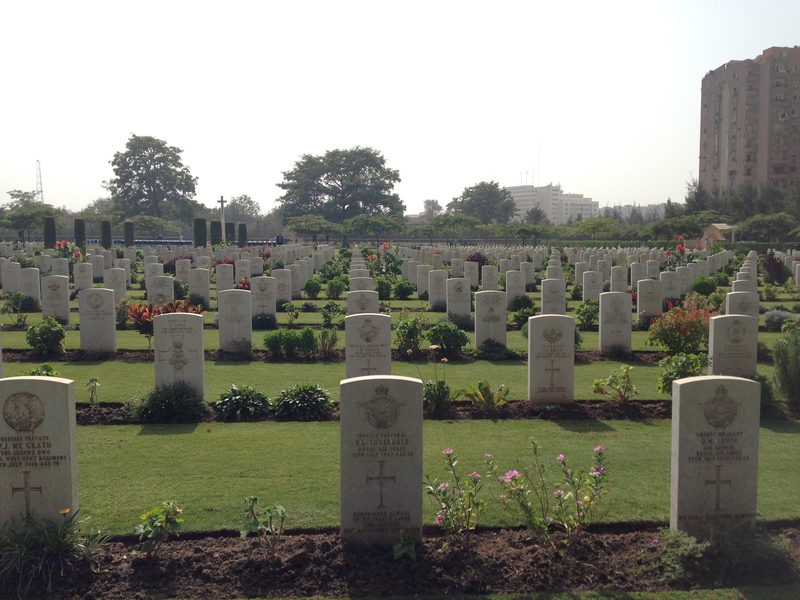 Though we stood in the middle of a cemetery filled with the graves of members of the Commonwealth military, from around the world, who had been killed in numerous conflicts and wars, we heard the laughter of children playing. Life persists in spite of the cruelty and hatred, in spite of the violence and war. And when life persists, there is a little part of us that stands up to say that war and violence will not ultimately win the day. When life persists, there is a witness to the hope that the world will be better for the children who are born today. As children’s laughter drifted over an international and interfaith assembly observing a moment of silence, I gave thanks for the tenacious spirit of life that has persisted in spite of humanity’s best efforts to drown it out. There was something sacred, holy, set-apart, about that gathering on Sunday. The fact that people from a number of countries, not always friends, came together. There was no denying that they were there, representing their respective countries, yes, but also representing something bigger–the desire and yearning and hope for peace. And though I was there as part of a group to provide music, beautiful music if I must say, the most sacred music of the day was that laughter, drifting over us and calling us to remember and celebrate and protect the sacredness of life. Unbeknownst to them, but recognized by more than one who stood in silence, the laughter of those unseen Egyptian children was a witness to the tenacity of life, in the midst of a field dedicated to the reality of death. One of the things I love best about Egypt is the way relationships are valued. There’s a sense that the person in front of you right now is the most important person. And whether it is someone you have known forever or have just met, that person is important. I experienced that today in a frame shop. Earlier this morning, a couple of members of the church met here so one could take the other to her favorite Cairo frame shop. They invited me to have coffee with them. I had a to-do list for the day, but it’s hard to turn down coffee and good conversation, so I went with them. After good coffee and laughter and conversation, we headed to the frame shop. When we got there, the owner, who speaks good English, wasn’t in. The three of us each speak a little Arabic, but not nearly enough to explain what we wanted. Lucky for us, a middle aged man was there whose English was excellent. He had stopped into get a couple of photos framed. He was wearing a shirt and tie and looked like he would probably be heading back to work after he finished what he had thought would be a quick errand. Instead, he patiently translated for us, staying for close to 30 minutes to help us pick out the frames and mats for my friend’s prints, translating and visiting with us. His name was Mohammed and he is a demonstration of so much of the kindness and hospitality we have experienced here. We will probably never see him again, but he put whatever else he had on his to-do list for the day and stayed around to help us. It’s these little things that add up and make up for the traffic and pollution and noise that can make me crazy. I’m glad I put my to-do list on hold for a few hours this morning. It will all get done. I am well-caffeinated and my heart is full. Thanks, Mohammed, for your time and kindness and the reminder of all of the beauty that is hidden among the dust of this crazy city. During our recent visit to the States to see friends and family, we were asked many times, “Do you like it in Egypt?” I always answered yes, which is 100% true. Sometimes, though, its hard to explain just why I do like it. A friend, also an expat who arrived just a few days after us last summer, is writing an article about expat life in Cairo. We spent a good chunk of a dinner conversation trying to explain just what it is. Cairo is loud. It’s dirty and crowded. Things rarely work as planned and people are perpetually late. You are never entirely certain if you’re getting a straight answer from someone. Arabic is hard, and though mine is coming along, I still get frustrated by the language barrier more often than not. Both of us have been beyond blessed by amazingly smart, talented, funny, and interesting colleagues. We have met people from many walks of life, and from many places, who have enriched our own stories by sharing theirs with us. And at the end of the day, it’s the people who allow me to say, without hesitation, that I love it here. We returned from our home leave at the very end of Ramadan. On the last work night of the month, StARS hosted an Iftar dinner for staff and friends of StARS. In preparation for over one hundred people attending, several staff members worked to set up chairs and tables in the courtyard. As sunset approached, the tables were set with bottles of water, dates, and salads. Food started to come in from a number of staff members and friends of StARS. Huge bowls of rice, massive trays of bread. Chicken and meat. Eggplant stuffed with meat. Yemini, Iraqi, Eritrean, Sudanese. At 6:54, the sun officially set and the feasting began. Muslims who had abstained from food and drink all day guzzled down water. The line represented our community–refugees and expats, Muslims and Christians–all together, laughing, chatting, looking forward to the feast we were about to share. As we walked through the line, our plates grew heavier and heavier with food. My Arabic tutor told me it’s not uncommon for people to gain five kilograms during Ramadan (about 11 pounds) because even though they fast during the day, they make up for it at night. After eating the meal we ate that night, I believe it! We each had a piece of Yemeni bread, which is a huge flat bread (think BIG lefse griddle size for all you midwest Norwegian readers! ), sort of like naan. About halfway through the meal, I realized that I had been using bread to scoop up the various meat dishes and hadn’t even touched the rice that was hiding under it. I made a valiant effort, but still couldn’t finish everything. We all ate until we were stuffed (and then some) and no one went away hungry. Anyone who wanted to take home leftovers could, and did. And while the food was delicious, it was the conversation and laughter that made the evening so satisfying. People sat around, chatting, sharing jokes, telling stories, speaking in several languages. Kids ran around and played. Our resident DJ played music and people danced. 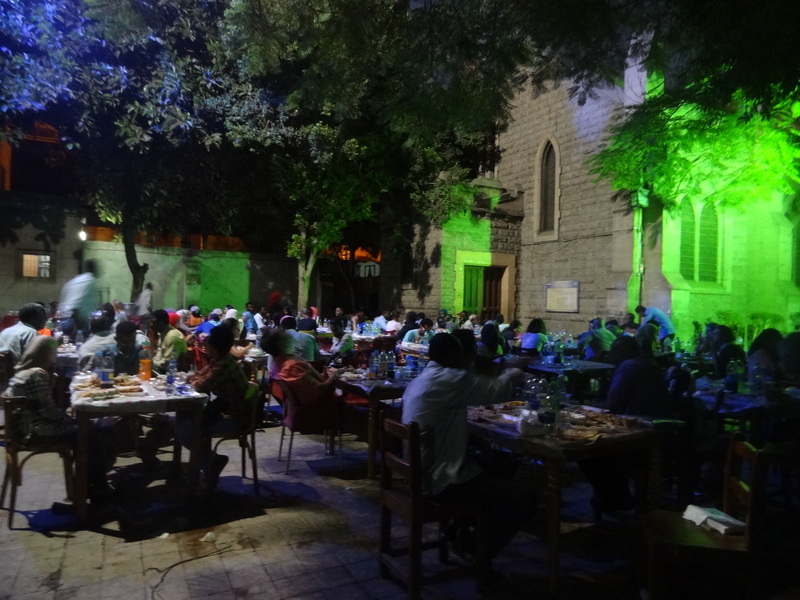 At one point, a favorite Sudanese song came on and several Sudanese staff members rushed to the makeshift dance floor (a clear spot in the courtyard) to dance, pulling along friends from Eritrea, Somalia, the Netherlands, and the States to dance with them. About a week later, we gathered once again, this time in the Guild Hall (built in 1920 with funds from the Scottish Presbyterian Women’s Guild), for the wedding celebration for one of the StARS staff. Again, we laughed, we danced, we shared stories. Babies were passed around. Cake was shared. The couple was welcomed and congratulated. The groom beamed. Once again, our resident DJ was on hand to provide music. The joy was palpable in the air. It was an absolutely delightful evening. We returned home, after having helped to clean up, exhausted, but with overwhelmingly happy hearts. These are the things that keep us going. These people who make us laugh and pull us up to dance and allow their stories to become interwined with ours; these experiences that remind us that inspite of all the darkness and despair, there is still a lot of happiness and a lot of hope. There are still a lot of things that bring us together–music, and dancing, and weddings, and food. Though there are differences, there are more things that unite us. And is this unity, this sharing, that keeps smiles on our faces, in spite of the layers of dust and sweat. It’s the joy that makes our hearts happy, even as we collapse exhausted on the sofa. It’s the warmth of community that makes up for the warmth of the air. Why do I love Cairo? For the same reason I love Chicago or Madison or Portland or New York or Stewartville or Vincennes or any of the other places I love to be. Because Cairo is where my people are. The people who make me smile and laugh and might even convince me to dance. And with people like that, its hard not to love the city they’re in. Today is World Refugee Day. For most of the refugees living in Cairo and around the world, it’s just another day. Another day of being far from the place they long to call home. Another day of looking for a job or standing in line for water. Another day of dreaming of a new home. Another day of wondering where friends or family are and if they are safe. Another day of waiting, hoping, dreaming. As of January 2014, there were 253,268 registered refugees in Egypt. As of June 17, there are 137,916 registered Syrian refugees in Egypt. The numbers of Somali, Ethiopian, Eritrean, Sudanese, South Sudanese, Iraqi, and other refugees are not released as often, but the total number of refugees in Egypt has certainly grown since January. When we think of refugees, we often think of camps–places where, though meager, food, shelter, and water are provided. Education is offered for the children and health care is available. For the nearly 280,000 refugees living in Egypt, this is not the case. Here, urban refugees must find a place to live. They need money to buy food and pay for health care. Tuition is charged at nearly all of the schools. They face different challenges, as they struggle to find a place in a strange land. Many speak Arabic, but even then, the dialect is sometimes different. Though there are many NGOs in Cairo serving the refugee community, there’s never enough money, time, or space. We all have our wish lists. We all have dreams about what we could do, if only there was more time, more money, more space, even as we fervently wish that peace would come to countries ravaged by violence and war. We listen to horrific stories and it’s sometimes really hard to see hope. Which is why the World Refugee Day celebration last night was so important. Held in the garden of one of the private clubs in Cairo, I watched as refugee children sat in the grass and ran their hands through it–a rare treat in this (broken) concrete jungle. I watched as children ran and played together, seemingly oblivious to the cultural differences that might threaten to divide them. When music started, a group of Iraqi men joined together to dance and were soon surrounded by Somali, Sudanese, Eritrean, and other refugees who clapped along and held up phones to take photos. Soon, they traded places with Eritrean dancers. And then a group of South Sudanese children took the stage to perform a play they had written together. Handicrafts from the different communities were available for sale. We sampled delicious Somali and Eritrean food. We don’t get a chance to celebrate all that often. A lot of the time, it feels like there isn’t anything to celebrate. But last night was a respite for all of us–refugees and those of us who work with and for refugee organizations. It was a celebration of the beauty of the cultures that refugees here in Cairo treasure. It was a celebration of the ways that people can set aside differences and laugh, dance, and play together. It was a celebration of the beauty that is in the world, despite all of the things that threaten to divide us. We keep our eyes open for these little things, signs of hope, promise, light in the midst of darkness. We dream of a day where there won’t be a need for World Refugee Day because peace will reign in every land. Until then, we listen to stories, we learn from one another. We work for justice and pray for peace.